Insert the first disc of the set in your DVD player and form the Main Menu go to the 'Setup' section. There, highlight the 'Main Menu' entry and press the 'Left' arrow key on your remote control to highlight the enter key on the keyboard. Press 'enter' now and you will see a clip of the Seinfeld cast talking about the Rob Reiner tribute. Go to the 'Extras' section of the disc and highlight the entry' Running With The Egg: Part 1. Press the 'Up' arrow key to highlight the poison spray can. 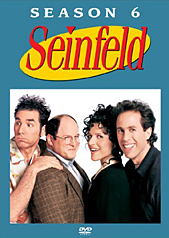 Press the 'Enter' button and you will get to see the Seinfeld-imation. Insert the second disc and go to the 'Extras 'section, accessible from the Main Menu. There, highlight the menu entry 'Setup' and press the 'Right' arrow key on your remote control twice to highlight the pecan. You will now see a small clip featuring Jerry Seinfeld talking about the little things in the show. Insert the third disc of the set. There, go to the 'Extras 'section and highlight the 'episodes 'menu entry. Then press the 'Left' arrow key on your remote control to highlight the pencil, which will take you to a clip of Jerry Seinfeld talking about the Dark Side. Insert the fourth disc of the DVD set and go to the 'Extras' section. Highlight the menu entry 'Cramer vs. The Monkey' and then press the 'Up' arrow key on your remote control. This will highlight the hot dog and if you press 'Enter' now you will get to view a clip of Jerry discussing the pain he caused on the show.